Dilatation, or dilation, is to stretch an opening to a larger size. When an individual has stenosis of the laryngeal airway or the trachea, a dilation procedure is one option for treatment. The two primary methods of dilation in these cases are to use either a balloon expansion device or successively larger tapered laryngeal dilators. With tracheal stenosis, a balloon expansion device might be used more often, but for high tracheal stenosis, the tapered laryngeal dilators can also be very effective. This individual has undergone at least a dozen prior dilations, each of which provides dramatic relief from noisy breathing and exercise intolerance. Here the patient is halfway to needing re-dilation, due to the typical inflammatory stenosis that is seen. Compare with photo 2. One week after one of this patient's dilations (with Kenalog injection and topical Mitomycin C), showing a dramatic widening of her airway; compare with photo 1. After a number of years, inflammatory lesions such as this sometimes "burn out," and the interval between dilations increases. Middle-aged woman with unexplained shortness of breath and noisy breathing, due to this idiopathic inflammatory and very high subglottic stenosis. The patient initially declined dilation due to her anxiety. She also had granularity of the nasal septum and a positive ANCA profile for Wegener’s granulomatosis. Five months later, the symptoms became intolerable, and the stenosis was noted to be slightly narrower and with a greater posterior component. The patient agreed to dilation. 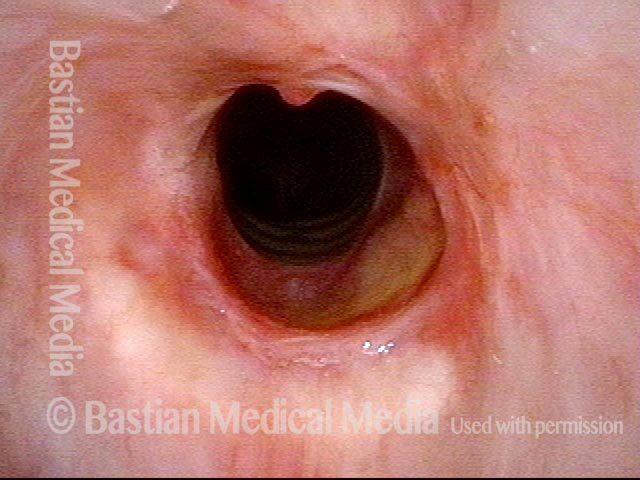 Same exam as photo 2; this close-up view shows more clearly the inflammatory nature of this stenosis. Five days after outpatient dilation, triamcinolone injection, and topical mitomycin C application. The patient’s symptoms have vanished, the harsh inspiratory noise is no longer heard, and the size of the airway, though still not normal, is more than doubled. Compare with photo 2 of this series. Same exam as photo 4, close-up view. 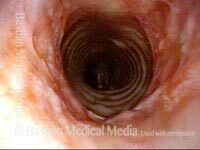 Intensification of the inflammatory changes of this stenosis are expected so early after dilation. 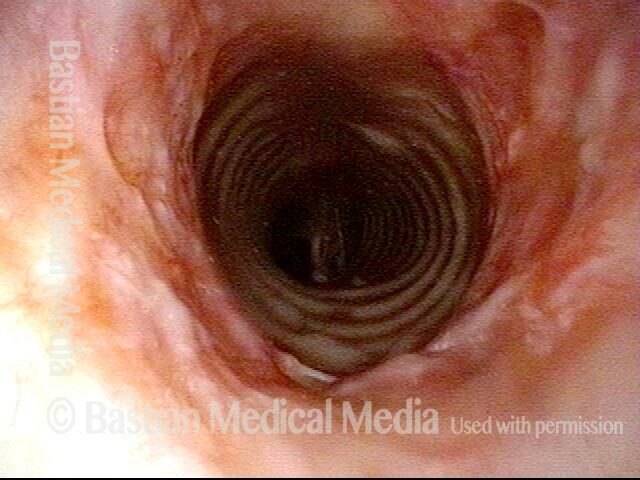 Compare size of the stenosis with photo 3 of this series. 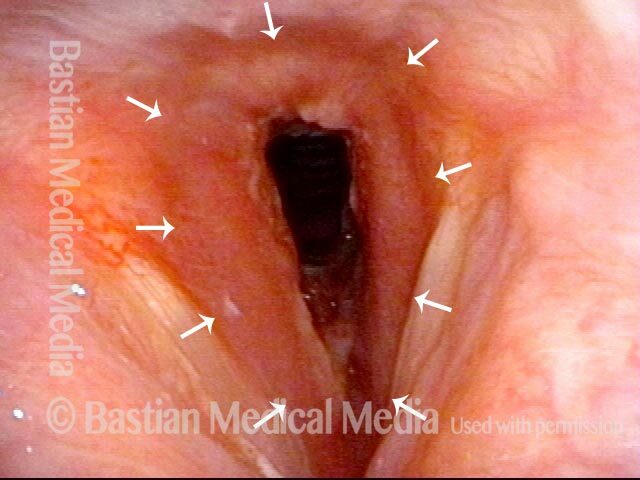 Marked inflammatory narrowing in the immediate subglottis. Within the ring of arrows is the inflamed, reddened tissue, which is narrowing the airway into the shape of a slit. This man needs to be active for his work, but notices shortness of breath and noisy breathing with exertion. Nine days after a dilation procedure, with local steroid injection and painting with Mitomycin C. The airway has widened, so that it is more oval-shaped and less slit-like. Compare with photo 1. Although a degree of stenosis remains, symptoms have subsided dramatically. For reference, asterisks mark the same points in the subglottis in this photo and the next photo. 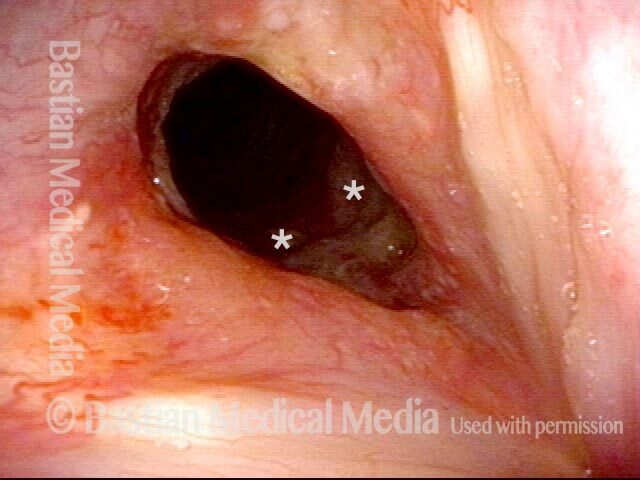 Same exam, looking beyond the immediate subglottis. There is an inflammatory response that involves several centimeters of the upper trachea. 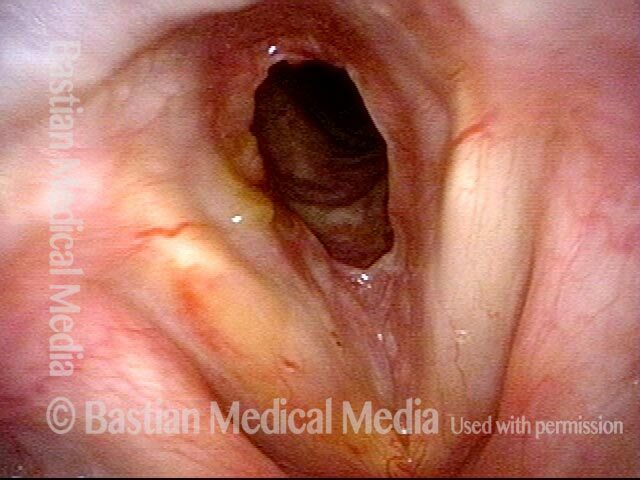 Inflammatory areas often “trap” mucus, as seen here. Now five months after the dilation procedure mentioned in photos 2 and 3. The patient has been receiving systemic treatment with methotrexate and prednisone. General appearance of the inflammation has decreased. 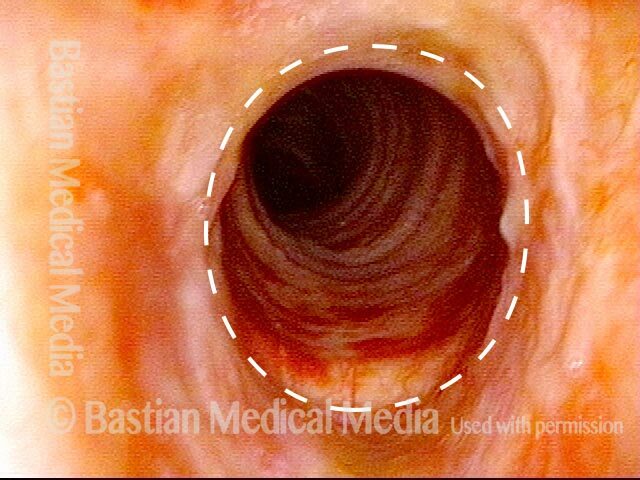 In spite of this, as expected, the stenosis has persisted (dotted oval shows the estimated caliber or width of a normal airway) and symptoms have gradually increased. Thus, another dilation was scheduled for the next day. A week after photo 4, following the most recent dilation. 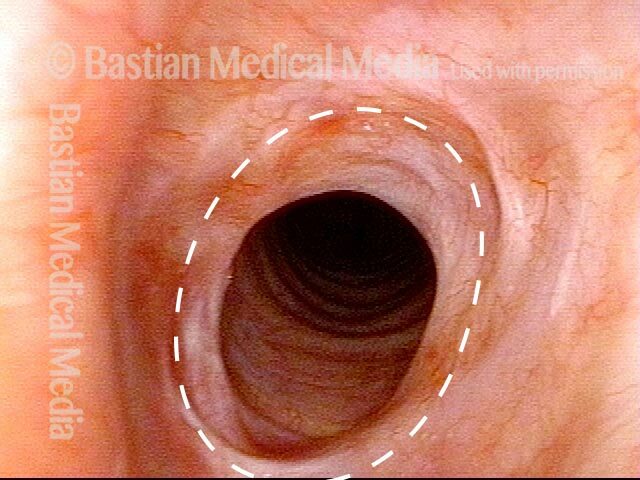 There is expected immediate postoperative inflammation and an increase in the airway’s caliber or width by an estimated 30% (dotted oval again shows the estimated caliber or width of a normal airway; compare with photo 4). Symptoms are again abolished.